​A lot of young girls and pretty women love wearing either Jack Rogers sandals or Palm Beach sandals. Some women do love both of them. Some are die hard fans of Jack Rogers while some swear to wear only Palm Beach sandals. A lot of folks compare both these brands and argue about the superior quality of one brand over the other. Today, I am here to share my opinion about which brand is best in terms of quality, comfort and best return on your investment. So without further delay, let us compare these brands and find out who is the true winner. If you ask me, I will surely tell you that in terms of quality, comfort and customer support, Palm Beach sandals are by far the best brand among the two. Anyway, I am here to provide you more comparison between the two sandals so that you can make more informed buying decision for yourself. So without further delay, lets delve into it. ​Which Came First; Jack Rogers or Palm Beach Sandals? ​Are Palm Beach Sandals the Same as Jack Rogers? ​Where are Palm Beach Sandals Made? ​Which Sandals are More Comfortable Between Jack Rogers and Palm Beach Sandals? ​How to Wear Jack Rogers & Palm Beach Sandals? ​If you are a die hard fan of genuine, 100% hand crafted and premium leather sandals then Palm Beach Sandals are perfect for you. Its classic, preppy style, and fashionable look makes it unique and attractive choice for young and pretty ladies. Superb quality and luxurious looks are synonymous with Palm Beach sandals. You might have known about the famous Jackie Kennedy as well as Lilly Pulitzer, who were a great fan of these types of sandals. As far as Jack Rogers company is concerned, it was first founded in 1960. Its current headquarter is located in New York, USA. This company is producing different types of fashionable and exotic sandals, sneakers, booties, and flats, etc. Its one of the trademarked sandals is its Classic Jack sandals. Its sandals are specially known by the name as “Jacks”. Some of the most popular Jack Rogers sandals for women are Jack Rogers Georgica Jelly Thong Sandal, Palm Beach Navajo Classic Sandal, and Nantucket Gold Thong Sandal. On the other side, Palm Beach Sandals Company was the first one which started its work in the market before Jack Rogers. It is world famous for manufacturing custom made pairs of sandals as per the customer requirements. This company has two stores in Florida, USA. One is known as “North Store” and the other one is known as “South Store”. The best thing about this manufacturer is you can choose your own colors, sizing, and design before you place your order for custom made sandal. The company folks design the sandals as per your requirements after you place the order. And within 2-3 weeks, you get your custom designed sandal at your doorstep. All of their sandals are handcrafted with supple leather material. Its leather is premium level and provides much better comfort and support for your feet. Click Here to ​​Find Top Fashionable Boat Sandals for Men and Women. ​If you read the history of these companies, then you will realize that Palm Beach Sandals were the first ones which designed custom sandals for Jackie Kennedy. Jack Rogers were later started their own brand and designed their branded sandals and other footwear categories. ​The branding is different as far as the sandals are concerned. Palm Beach sandals differ from Jack Rogers sandals in terms of leather quality, footbed support, upper and outsole quality. So, yes, both sandals are different from each other although they look similar at the first look. ​They are made in Florida, USA. The company has their two official front stores in Florida, USA. As mentioned earlier, One is called as North Store and other one is known as South Store. ​If you consider the leather upper, footbed, outsole and the overall material quality, then Palm Beach sandals are very much superior to Jack Rogers. Palm Beach sandals are made from genuine and 100% premium supple leather material. Its footbed and upper offers higher comfort for your feet due to its higher quality leather lining. The soles are also made from premium leather and designed with double layer of leather. This gives your feet higher cushioning and comfort while walking. As far as Jack Rogers sandals are concerned, they make use of mixture of decent quality leather, plastic and vinyl material while manufacturing sandals. The mixture of these materials leads to poor support and comfort as compared to Palm Beach sandals. You also tend to get much higher arch support and higher breathability in Palm Beach sandals. Jack Rogers sandals generally get very sticky and sweaty for your feet if you walk in them for long hours. They also offer less arch support as compared to handcrafted and pure leather Palm Beach sandals. If you want to know the actual quality and manufacturing details of Palm Beach sandals, then I recommend you to watch the following video from start to end. I am sure you will realize how carefully and aesthetically the company folks follow the entire sandal manufacturing process. ​As far as sizing is concerned, for girls and women the company offers sandals of sizes ranging from 5 to 12 US sizes. You can measure your feet correctly either at home or at your local shoe store. And then order the correct sized sandal for your feet. You will have to visit either stores at Florida to get your new custom pair of sandals. You can also order the sandals if you have wide feet or narrow feet. The best thing of these sandals that I liked is its wide variety of colors. These sandals are available in lots of different color varieties. As far as Jack Rogers sandals are concerned, they come in very limited colors. ​Basically Jack Rogers and Palm Beach sandals are casual wear footwear. You can wear them at parties, at beaches and at swimming pool parties too. They look great with t-shirts, tank tops, shorts, jeans and casual sweaters. For any casual outdoor activities and shopping purpose, these sandals look great and offers good comfort and support for your feet. I recommend you to take a look at the following video to understand what style clothes look good with these sandals. ​I know there are thousands of fans out there who are die hard fans of Jack Rogers sandals. I don’t hate this brand. But I am trying to provide few facts which I have derived from my extensive brand research. For Jack Rogers lovers, I am providing 3 top Jack Rogers sandals for women which ladies have admired and loved a lot. Take a look at them. ​At no. 3, I have ranked this particular Jack Rogers Palm Beach Flat Thong for few specific reasons. The first reason is it is decent quality synthetic leather material. The second reason is its look which is classy and stylish. You can match them with your casual dress style easily. Although, it takes some time for them to break in initially but once you break in, you can walk in them pretty comfortably. Click Here to See Latest Price and Reviews of Jack Rogers Palm Beach Platinum Flat Thong for Women. ​This is second best selling women’s sandal of Jack Rogers. This specific Jack Rogers Hamptons Sandal has incorporated synthetic leather sole along with proper rubber heel for enhanced support. The upper is designed with metallic leather and footbed is made from durable leather material. It offers much better comfort and support while walking. I find that it offers less arch support and it is not ideal for women with narrow feet. So choose carefully as per your foot size. 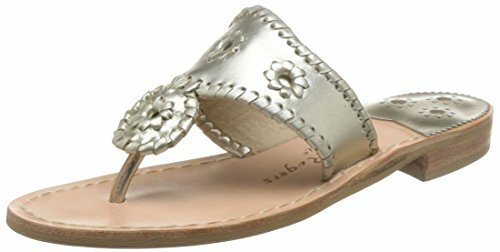 Click Here to See Price and More Reviews of Jack Rogers Women’s Hamptons Sandal. ​Jack Rogers Georgica Jelly Thong Sandal is the number one highly recommended sandal if you are interested to try out the best sandal of this brand. Its sole and footbed is made from synthetic leather material. So, you will get medium comfort and support as compared to pure leather Palm Beach sandals. Its upper is designed in the interesting manner which attracts the attention of people quickly. Its unique jelly construction is ideal if you want to roam around water or beach area. It is built in water friendly manner which is helpful for you if you often visit beaches and swimming pool locations. The overall looks are really shiny, bright and stylish. So, these sandals are ideal choice for pretty girls and stylish women. Click Here to See Latest Price and Reviews of Jack Rogers Women’s Georgica Jelly Thong Sandal. ​In the end, I would like to conclude with my opinion about the comparison between Jack Rogers and Palm Beach sandals. Both of these brands produce pretty good quality sandals for women. If you love exotic, stylish and comfortable casual sandals then both these companies manufacture lots of good quality and durable sandals for your needs. But when it comes to comparing both the brands, I would say that Palm Beach sandals are more comfortable, stylish, durable and supportive for your feet. Palm Beach company has only 2 outlets; but they emphasize on delivering really high quality goods and highly personalized customer service. In terms of customer service and after sales support, Palm Beach sandals ranks higher as compared to the service provided Jack Rogers. Jack Rogers sandals are easily available anywhere in any parts of USA. But custom designed sandals can only be made with the service provided by Palm Beach company. I know, there are lots of fans present who speak good words about Jack Rogers. But its my own choice and opinion that I prefer Palm Beach sandals more over Jack Rogers. At the end of the day, its your own choice and preference which makes all the difference. So my recommendation is try both the sandals and see the results for yourself. Good luck! Hi Friends, I am Vishal Mahadik, the owner of VBMBestReviews.com. This is the website where you will get to read all kinds of quality boots, shoes and sneaker reviews. I am an avid writer by profession and love to write about the latest shoes, boots and sneakers. Don't forget to comment, subscribe and share the articles if you really like it. Thanks for your time. VBMBestReviews.com is a participant in the Amazon Services LLC Associates Program, an affiliate advertising program designed to provide a means for sites to earn advertising fees by advertising and linking to (“VBMBestReviews.com” (Amazon.com, MYHABIT.com, AmazonSupply.com, or AmazonWireless.com).